All meats and entrees are smoked or grilled on our custom BBQ Trailer, using seasoned Black Oak, and complemented by our Blackberry BBQ Sauces. Our specialty salads and side dishes are made with the freshest, seasonal (Local & Organic) ingredients Local Grass or grain-fed Beef and strictly organic ingredients provided upon request at an additional cost – Please call for Quote. The traditional Blackberry Bramble Dinner Menu is served with 2 Entrée’s, Vegetable, Salad, Side Dish & Fresh Bread. 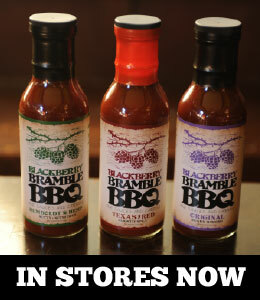 We also offer a Blackberry Bramble BBQ Picnic and Lunch Menu. Appetizers and Desserts are available for an additional fee. We offer four service levels (A) Food prepared and delivered, (B) Food prepared and delivered with buffet set up, (C) Food prepared and delivered, buffet tables set with BBQ trailer on site* and (D) Finest level of service: choice of buffet or waited tables. * Prices are negotiable depending on amount of service needed.